Moving exhibition in the Médoc for the “Scènes d'Eté en Gironde” organized by Michèle Malavallon. 1. PATIRAS : 20' video. Opening and closing on the world of the Garonne (river) filmed from the barge of Airbus boat, during the video I look back on people I've met in the Estuary, their lives, their thoughts. 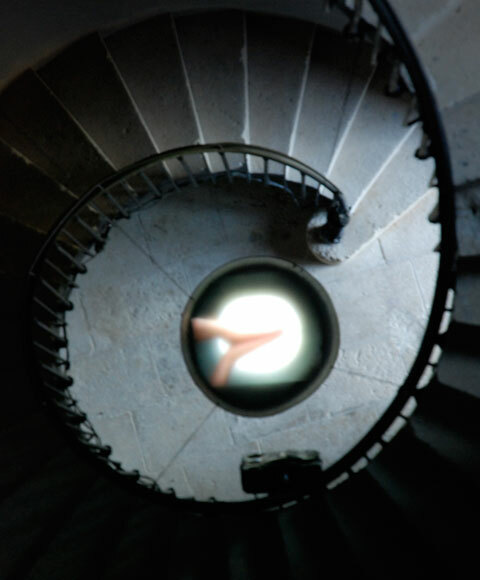 The film is projected on a milky liquid in the center of the Patiras lighthouse. 2. VIS A VIS : 35' video. Old man voice from the Estuary is telling us about his childhood and other memories. To symbolize the old man's living spot, whom lived between two banks, two flat-screens are placed upon on each one easel, which each show one bank of the estuary. 3. MADEMOISELLE : 8' video. Static shot on the estuary with a background voice of a man having a relaxation session whilst the image changes slightly as if it had hallucinations.